It sometimes surprises people but the boarding school I was lucky enough to attend during my final two years of high school was focused on math and science. While I did not love calculus, I generally love numbers and math and puzzles and figuring out how things all fit together. When I’m knitting lace patterns I tend to set up spreadsheets to calculate my progress through the project and my recent project–Clothilde, a Knitting Kninja pattern–was no exception. This came in handy when I was trying to decide if I had enough yarn to add a second repeat of chart two to the edging. Using my spreadsheet I calculated the number of stitches in the first repeat. 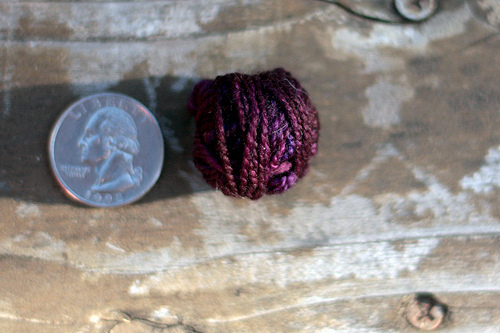 Before I began knitting this repeat I weighed my ball of yarn, finding that I had 33 grams left. I knit the repeat and weighed again. 20 grams. The number of stitches in the remaining repeat and the bind off was approximately 135% larger than the first repeat. 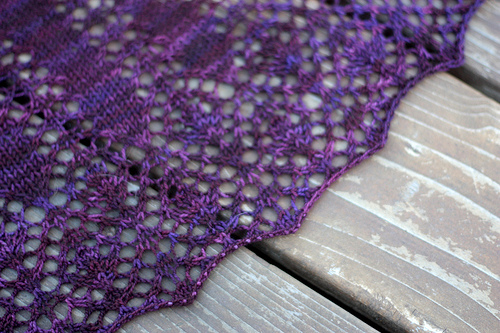 135% of 13 grams is 18 grams, so the math told me that I’d have enough yarn to finish the shawl the way I wanted. Because I am cautious, I inserted a lifeline in my knitting and forged ahead. And wouldn’t you know it? I ended up with 2 grams left over, a whopping 7 yards of yarn. It’s like magic when the math works out like that, only you know, with proof and reasoning to back it up. Next to an out-of-focus quarter for scale. I don’t normally like to cut it so close with my yarn remainders but I love using up all of my yarn. It’s so gratifying. I don’t know about maths (numbers is hard) but that yarn looks positively edible. Wow, and here I thought I cut it close with 10 yards leftover after a pair of socks!